Last November, a fully insured North Dakotan was dispatched on an 84-mile medical air transport from Langdon, N.D., to Grand Forks. When the charges came in at more than $66,000, out-of-network insurance covered just $16,000. The patient was left with a $50,000 bill balance from Valley Med Flight. The tab far exceeded the $29,000 to $30,000 average price for a cross-country charter flight on a private midsize jet from Virginia to Oregon—according to an informal estimate by the charter company EvoJets. According to tallied complaints lodged with the state's insurance department and provided by Blue Cross and Blue Shield of North Dakota, surprise charges for various medical flights from the past four years ranged from $26,000 to nearly $534,000—although the latter number is a major outlier. Most charges fell between $30,000 and $88,000, with the average hovering around $60,000. Because of an outstanding bill, a lien was placed on one North Dakotan's home. Another had wages garnished. Families have gone into bankruptcy. "They have health insurance, but no control over who picks them up," said Jeff Ubben, the state's deputy insurance commissioner. Like other states, North Dakota has tried to curb the unexpected bills. In 2015 the Legislature passed a law to split the medical air transport companies into two call lists. To make it on the primary call list, the company would have to be in-network with at least 75% of the state's health insurance contracts. All others would have dropped to a secondary call list and would only have been able to respond if none of the companies from the primary list picked up. In 2016, a federal judge struck down the law after Valley Med Flight sued, just as federal judges around the country have struck down similar state measures for violating the Airline Deregulation Act of 1978. This federal law bans states from regulating rates, routes or services of commercial airlines and continues to overrule state efforts to rein in air ambulance charges. Valley Med Flight is one of North Dakota's largest medical transportation companies, re-branded this year as Guardian Flight. 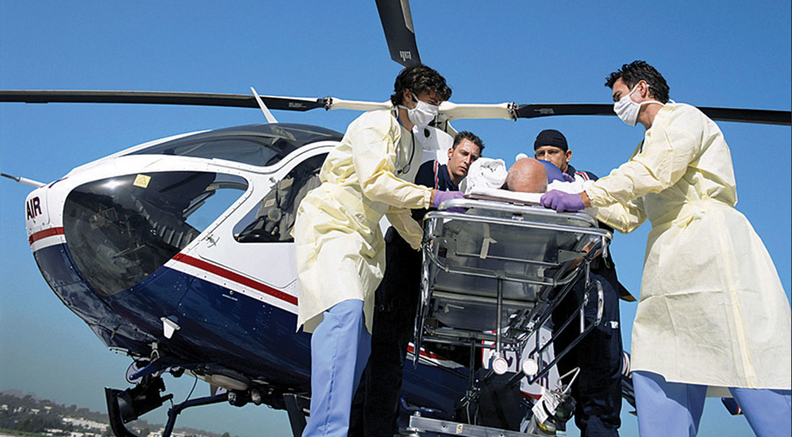 As a subsidiary of Air Medical Group Holdings, which is owned by the global investment firm KKR, it is one of several sister air ambulance companies operating in the U.S. In 2017, North Dakota policymakers tried again from a different angle, this time limiting out-of-network insurance reimbursements. If a person is transported by an out-of-network air ambulance, the transport company must accept the rate of an in-network carrier. Guardian Flight sued, but the case is still pending in federal court. Ubben told Modern Healthcare his office hasn't received consumer complaints since it went into effect in January of this year. But Congress would need to change the law to allow states to regulate the charges. Sen. Claire McCaskill (D-Mo.) pushed a bill this year to clarify that the 1978 statute could not prevent states from regulating the medical costs from air ambulances. Provisions from her proposal made it into the latest Federal Aviation Administration reauthorization bill expected to clear Congress this week, but ultimately lawmakers dropped the crucial measure that would allow states to address the consumer cost question. The final compromise provision requires the U.S. Transportation Department and HHS to convene an advisory committee of stakeholders to examine transparency measures, consumer education about insurance options for air transport and protections from excessive charges. Air ambulance companies would also need to list the Transportation Department's complaint hotline and website address on all bills. The Transportation secretary would have to set an industry oversight plan and write guidance for states on how to refer billing complaints. The provisions concur with some 2017 recommendations from the U.S. Government Accountability Office, which called for greater price transparency and better handling of consumer complaints. Insurers, insurance commissioners, patient advocates and the medical air transport industry herald the measure as "a step in the right direction," but it's unclear just how significant that step will be. The Transportation Department already oversees and handles consumer complaints on air transport, but close observers of the balance billing issue say the current process doesn't support patients stuck with tens of thousands of dollars of debt. "The Department of Transportation has regulatory authority and can determine whether the practices of any airline are fair or unfair, but they don't have expertise on medical billing practices," said Julie Mix McPeak, president of the National Association of Insurance Commissioners and Tennessee insurance commissioner. The association has been working on the issue for the past three years. "However, the department has yet to take action, and states are barred legally from doing so." The Association of Air Medical Services, or AAMS, the lobbying group for air ambulance companies, supports the final provision as a balanced approach. "We believe the formation of the advisory committee of stakeholders tasked with solving the complex issue of balance billing is a definite step in the right direction," the group said in a statement. "AAMS advocates for any effort to increase transparency to ensure our patients are not burdened by a bill that they did not expect and cannot afford." But ultimately the trade group blames the high balance bills on what they deem as inadequate Medicare reimbursements. The AAMS compares the air transport companies' net financial position with that of rural hospitals serving mostly government-insured or uninsured patients. The AAMS wants Congress to look at recalculating the air ambulance Medicare reimbursements, claiming it's "the only lasting solution" to protect air medical services, especially in rural areas. Both the House and Senate have introduced bills that would launch this effort, which are supported by the AAMS. Medicare's base pay for a single helicopter transport is $4,624, then an additional $31.67 per mile. According to data from the CMS, Medicare reimbursement for a typical 61-mile trip is about $6,556. The AAMS says that based on an independent study by the consulting firm Xcenda, Medicare covered 59% of actual costs in 2015. But one consultant, who spoke on condition of anonymity, pushed back on companies' claims that their charges correlate to their Medicare reimbursements. He said that the Medicare fee schedule, which moved reimbursements for air ambulances from Medicare Part A to Part B, favored the air ambulance industry when rates were set in the early 2000s. He argued that the industry's claims about compensating for Medicare rates through high commercial and balance-bill charges "are more related to underutilization and overcapacity." "In 1997 there were about 350 helicopters doing this," he said. "Today there are over 1,100." He estimated that Medicare pays for about one-third of these flights, commercial plans pay another one-third and Medicaid covers roughly 20% of the rest. "When two-thirds of customers paid at a rate that's favorable, the companies tripled the number of helicopters," he said, adding that the industry's ability to spread its fixed costs over a large number of transports is reduced because there are too many transports. "The problem is not that operating costs have dramatically increased; rather, companies cannot spread those costs over a reasonable number of flights," he said. "The industry then attempts to use this self-inflicted situation as justification for their extravagant billed charges." Aaron Todd, CEO of the operator Air Methods Corp., acknowledged in a 2015 investor earnings call that the number of transports may exceed market need. "And if you ask me personally, do we need 900 air medical helicopters to serve this country, I'd say probably not, maybe 500, 600 could do well, but it's an open market, these are—we don't have certificate-of-need restrictions," Todd said, according to the call transcript. One insurance lobbyist, who characterized the air ambulance market as "the wild West," complained of the sometimes aggressive ways companies find patients in the limited pool. "I've seen air ambulances following the police radio and showing up at the scene of an accident," the lobbyist said. "They have all sorts of tactics to get called." Analysis of one company's data shows the number of medical air transports per base has declined as those bases have proliferated. According to numbers gleaned from past annual reports by Air Methods Corp.—one of the largest providers and publicly traded until a private equity firm bought the company last year—69 bases sent out about 39 transports each per month in 2005. In 2013, 179 bases each sent out about 25 transports per month. The company's annual number of total transports during that period increased from nearly 32,000 to just over 53,000. Rising operational costs for the air transport companies were the result of business decisions, the consultant said. "No one forced it; they just did it by themselves." He also said transport services develop relationships with the providers who dispatch patients from one facility to another for care. About 80% of transports send a patient from one facility to another, rather than airlifting a person from the scene of an accident. Even if they don't have a referral relationship with the air transport company, the consultant added, hospitals don't necessarily watch out for the patients' wallets since it isn't their money. "Again, you don't have a market where buyers or sellers are agreeing to buy some quality or quantity," he said. "None of this is a market situation."